Europe is a Swedish rock band formed in Upplands V?sby, Sweden in 1979 under the name Force by vocalist Joey Tempest and guitarist John Norum. Although widely associated with glam metal, the band's sound incorporates heavy metal and hard rock elements. Since its formation, Europe has released eight studio albums, three live albums, three compilations and seven videos. Europe rose to international fame in the 1980s with its third album The Final Countdown, which became a high commercial success and sold over three million copies in the United States. Europe rose to international fame in the 1980s with its third album The Final Countdown, which became a high commercial success and sold over three million copies in the United States. Europe was one of the most successful rock acts of the 80's and sold over four million albums in the United States alone and over 10 million albums worldwide. The band has achieved two top 20 albums on the Billboard 200 chart (The Final Countdown and Out of This World) and two top 10 singles on the Billboard Hot 100 chart ("The Final Countdown" and "Carrie"). From 1986 to 1992 Europe sold over 20 million records worldwide, making them the 4th most successful act from Sweden in history. Europe went on hiatus in 1992, reunited temporarily for a one-off performance in Stockholm on New Year's Eve 1999 and announced an official reunion in 2003. Since then Europe has released four records, Start from the Dark (2004), Secret Society (2006), Last Look at Eden (2009) and Bag of Bones (2012). 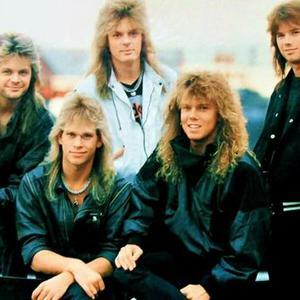 Born in 1979 from the underground suburban rock music scene in the outskirts of Stockholm, Sweden, a young band called 'Force' won national acclaim in the early 80's after emerging victorious in a nation wide talent contest. Their main influences were British rock bands of the 70's: UFO, Thin Lizzy, Led Zeppelin. Winning a recording contract, core members Joey Tempest (vocals), John Norum (guitar) and John Leven (bass) re-named themselves "EUROPE" and went on to record and release two ground-breaking albums titled "Europe" and "Wings of Tomorrow" in Scandinavia and Japan. The band toured widely on the strengths of these two records, and in 1984 recruited new members Mic Michaeli (keyboards) and drummer Ian Haugland. The success these albums generated on their home soil and in the Far East landed them an international record deal with Epic Records in New York; and in 1986 Europe went on to release their third album "The Final Countdown" produced by Kevin Elson (Journey, Mr Big). Upon its release, from Moscow to Manhattan and Stockholm to Sydney "...Countdown" conquered the airwaves and the epic rock anthem succeeded in penetrating the global psyche. The prominent (and now legendary) keyboard riff and memorable melodies catapulted the song into the top ten charts in the UK and USA, and the title track reached number one in 24 countries. It was at this time, John Norum chose to leave Europe to pursue a solo career, and was replaced by another well-known Swedish guitarist, Kee Marcello. Selling in excess of six million units, and resulting in an extensive world tour, "The Final Countdown" became a global phenomenon. Two years later Europe emerged again with their fourth album titled "Out of this World", produced by Ron Nevison (UFO, Thin Lizzy, Heart). This album delivered trademark Europe melodies and inspiring musical arrangements. Also a remarkable success, Europe embarked on a second world tour and were the first international rock-act to perform behind the 'Bamboo Curtain' in Bombay, India in front of a 60,000-strong audience. The follow up to "Out of This World" came two years later. The album titled "Prisoners in Paradise" was inspired by the band's time residing in L.A. Upon completion of yet another world tour, in 1993 Europe dicided to take time out to pursue personal projects and record solo albums. After an extended hiatus, the band came together again in 1999 (including original guitarist John Norum) on new year's eve in Stockholm Sweden to perform "Rock the Night" and "The Final Countdown" to usher in the new millennium. The performance not only marked Europe's first public appearance in almost a decade, but also inspired a permanent reunion. In 2004, with John Norum firmly back in the band, the original Europe lineup returned to the world stage with "Start From the Dark" - a raw, cutting-edge rock album that delivered a brand new style of melodic rock. The release saw the band's welcome return to the road as they embarked on an extensive tour in Europe, the United States and the Far East. Shortly thereafter, the band returned to the studio to record their 7th studio album titled "Secret Society" which was released in October 2006. Marking the most daring and innovative Europe album to date, "Secret Society" is both a return to their roots as well as a celebration of their collective musical experience and willingness to explore brand new territories. Followed by another world tour, the band continue to work hard to establish themselves yet again. It can be said that there are few bands from the 80's that still remain creative and relevant today with an edgy and modern sound. Following their summer 2008 European tour, Europe returned to the studio to record and then release their 8th studio effort, Last Look at Eden.